Feisty Fox Diaries - Fashion & LifeStyle Blog: International Giveaway - Ozel Lifestyle - 5 Winners ! International Giveaway - Ozel Lifestyle - 5 Winners ! We are thrilled to be hosting an exciting International Giveaway in collaboration with an amazing Online Shopping Website - Ozel Lifestyle. Ozel is a multi-brand online shop that provides access to international fashion for the nation's fashion connoisseurs. They have collaborations with celebrated International designers like Marchesa, Sass & Bide, Bodyamr, Mawi, Joseph Ribkoff and Mary Frances to bring fashion adorned by celebrities like Beyonce,Jennifer Lopez, Angelina Jolie, Cindy Crawford, Rihanna and our very own Aishwarya Rai, Shilpa Shetty, Lara Dutta among other well renowned celebrities. Their collection is straight off the international runway, to keep you ladies looking effortlessly chic. My personal favourites at Ozel are Marchesa and Ash Haute Couture. Marchesa is a New York-based fashion brand specializing in high end designer wear, named after socialite Marchesa Luisa Casati and has been worn by a number of Hollywood actresses on the red carpet like Penelope Cruz, Jennifer Lopez and several others. Ash Haute Couture is an exciting couture label spearheaded by designer Ashna Kalra, with International Presence at Los Angeles, New York City, Paris, Kuwait, Dubai & Lebanon is now exclusively available at OZEL ‪in India. My favourite section is 'Get the Celebrity Look' where they decode the style of your favourite celebrities and show you exactly how to get their look! So get the best of designer fashion, forget an expensive overseas trip and drop over at Ozel instead ! You'll find products that are affordable, chic, bang on trend with international sensibilities and very refined! 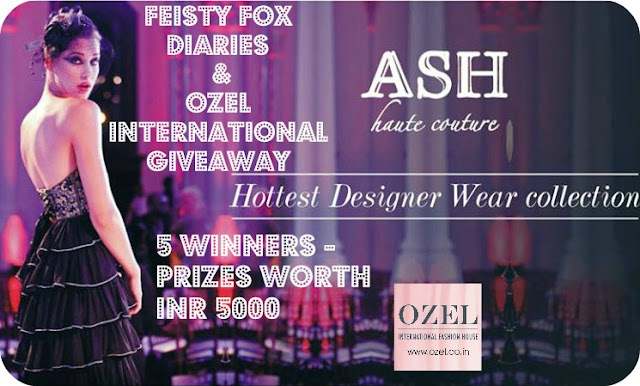 It gives me immense pleasure to announce that 5 lucky winners are set to win gift vouchers worth Rs 1000 each /approx $15 (USD)from Ozel Lifestyle ,with which you can shop from the following brands: Ash Haute Couture, Forever Unique, Aftershock London, Butterfly Twist, Marchesa. 3. 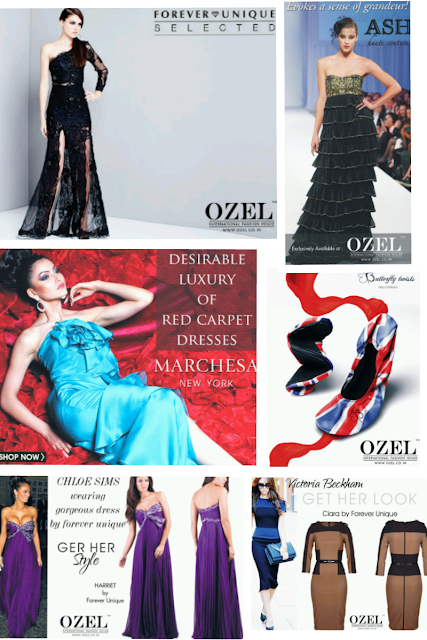 Register at Ozel Lifestyle Website and share the link of the product you like the most from the following brands: Ash Haute Couture, Forever Unique,Aftershock London,Butterfly Twist,Marchesa ; in the comments below along with your email address. Follow me on Twitter for additional entries to increase your chances of winning, and you can also get extra entries if you tag and invite your friends for this Giveaway on Facebook and Twitter. The Giveaway will run from today ie 20th September'13 and will close on 7th October’13. The winners will be declared thereafter and informed via email and will be declared on this blog post as well. The Giveaway is open to International readers, and I will be tracking the entries through this Rafflecopter Widget. Please make your entries in the Rafflecopter Widget below, when done with the above steps. For any query, you can mail me at feistyfoxdiaries@gmail.com and I will respond at the earliest. So good luck for the Giveaway and much love.